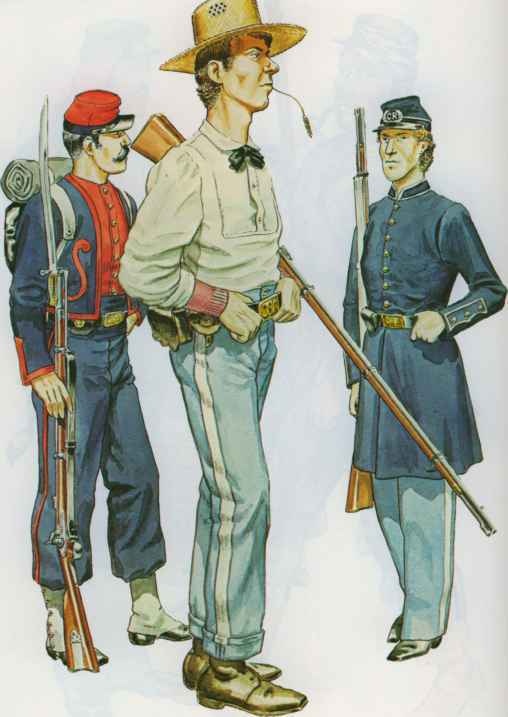 The figures illustrated in this plate (taken from contemporary photographs and engravings) show typical volunteer and militia uniforms worn in the early months of the Civil War by the Confederacy. 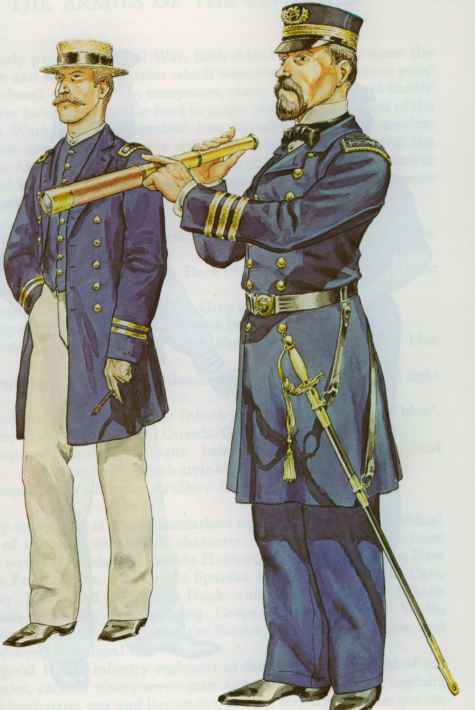 One uniform is based upon a much earlier style, including a flat-topped forage cap covered with black 'waterproof' as worn during the U.S.-Mexican War, and braided shell-jacket. The rifleman wears a leather 'hunting shirt', a traditionally-American garment worn by 'backwoodsmen' and pioneers for more than a century prior to the Civil War. Palmetto Guards appear to have worn a civilian-style suit, with the addition of military equipment and hat. The hat had an upturned brim on the right-hand side, with the letters 'p.G.' and a laurel wreath on the front; another small badge (probably the state emblem) was worn on the left-hand side. Two companies of South Carolina troops bore the title 'Palmetto Guards': Company 'I' of the 2nd S.C. Infantry, and 'A' of the 18th Battalion, S.C. Siege Artillery. The same name was also used by Company 'C' of the 19th Georgia Infantry. The rifleman is armed with a custom-built, heavy-barrelled sniper's rifle, with brass telescopic sight running the length of the barrel, and a 'set' trigger. Used in small numbers, principally by the Federals, these weapons, in the hands of trained sharp shooters, produced feats of scarcely credible accuracy. |-inch wide bands of gold lace, the lieutenant wearing one, commander two and captain three. To accommodate the rapid expansion of the navy during the war, the ranks of lieutenant-commander, commodore and admiral were re-created in 1862, and a new system of rank-marking devised in 1863, with several varieties of wide and narrow bands of lace being worn during the intervening period without much co-ordination. Rank badges worn prior to 1862 were as follows: Captain - shoulder-bars like those of the Army, blue cloth ground, gold lace border, silver rank-badges of eagle and anchor in centre; 1 ¿-inch gold lace band around cap, cap-badge of silver eagle and anchor in an oak and laurel wreath. Flag Officers (senior Captain, Squadron-commanders) - as Captain, but silver star at ends of shoulder-bars. Commanders - as Captain, but badges of silver crossed fouled anchors on shoulder-bars and inside cap-wreath. Lieutenants - as Captain, but one silver anchor on shoulder-bars and cap. Other officers had no lace on their sleeves, their rank markings being: Master - plain shoulder-bars, cap-badge as Lieutenant. Passed Midshipman - gold lace shoulder-bars, cap-badge as Lieutenant.Boat-swain - no shoulder-bars; cap with two thin bands of gold lace, plain gold anchor badge. Master's Mate - as boatswain, but silver anchor on cap; single-breasted coat. Rated Masters' Mate - as Masters' Mate, but with double-breasted short jacket, no cap-lace. Rank-markings after 1863 were as follows: Rear-Admiral: eight ¿-inch bands of lace on sleeves, gold star above top band; silver fouled anchor and two stars on shoulder-bars; cap-badge of two silver stars in wreath. Commodore - as Rear-Admiral, but seven laces on sleeve, silver star and gold fouled anchor on shoulder-bars, silver fouled anchor in cap-wreath. Captain - six sleeve-laces, silver eagle resting on anchor on shoulder-bars. Cap-badge as Commodore. Lieutenant-Commander - four sleeve-laces, silver fouled anchor and two gold oak-leaves on shoulder-bars; cap-badge as Commodore. Lieutenant - three sleeve-laces, silver fouled anchor and two gold bars on shoulder-bars; cap-badge as Commodore. Master - two sleeve-laces, shoulder-bars as Lieutenant but one gold bar, cap-badge as Commodore. 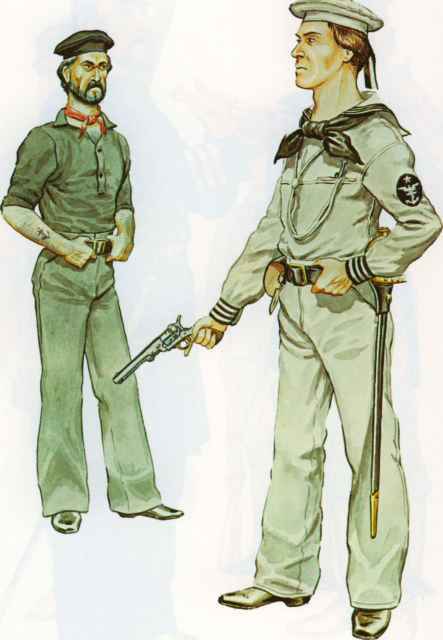 Ensign - one sleeve-lace, silver fouled anchor on shoulder-bars, cap-badge as Commodore. Gunner — gold star on sleeve, plain gold lace shoulder-bars, no device within cap-wreath. Boatswain - as Gunner, but silver letter 'B' on shoulder-bars. Carpenter - as Gunner, but no badge on sleeve, letter 'C' on shoulder-bars. Sail-maker - as Gunner, but no sleeve-badge. Midshipman - as Gunner, no shoulder-bars. Masters' Mate - as Midshipman, but single-breasted coat. The peaked undress cap was often replaced by the straw hat in summer; the frock-coat was often worn open to expose the waistcoat, white trousers being popular in summer. A shorter jacket was allowed for service dress. 63 a) Commander, U.S. Navy, Summer Campaign Dress, 1862. b) Captain, U.S. Navy, Undress, 1862. 64 a) Seaman, Confederate Navy. b) Petty Officer, U.S. Navy, Summer Dress. the Army, with steel-grey frock-coats, and bars of gold lace on the sleeves to indicate rank: Flag Officer four bars (the upper one looped), Captain three, Commander two, Lieutenant one, Master one without loop, Midshipman no lace, but three buttons on top of cuff. Waistcoat and trousers were white or steel-grey. Shoulder-bars were light blue, edged gold, bearing rank badges: Flag Officer four stars, Captain three, Commander two, Lieutenant one star, Master no star, Midshipman a strip of gold lace; Surgeons had black bars with one or two olive-sprigs in gold in the centre, Assistant-Surgeons the same but with gold olive-leaves; Paymaster as Surgeon but dark green bars, Assistant-Paymaster as Assistant-Surgeon, but dark green bars ; Chief Engineer blue bars with gold live-oak sprigs in the centre. Cap-badges were: Flag Officer — fouled anchor in oak-wreath, four stars above, all in gold, cap with gold lace band; Captain the same, but three stars; Commander two stars; Lieutenant one star; Master no star; Passed Midshipman just a fouled anchor; senior Surgeon three stars in olive-wreath, Surgeon with two stars, Assistant-Surgeon one, junior Assistant no star; Paymaster and Engineer ranks as Surgeon, with gold letter 'E' for Engineers. Straw hats and grey or white jackets could be worn on service.